LONDON--(BUSINESS WIRE)--Technavio analysts forecast the global hand tools market to grow at a CAGR of close to 4% during the period 2018-2022, according to their latest market research report. 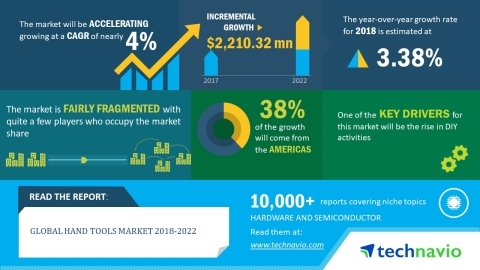 In this report, Technavio highlights the increasing innovations in the market as one of the key emerging trends in the global hand tools market. Manufacturers of hand tools are continuously innovating to overcome the shortcomings of the use of hand tools, such as exhaustion, work-related disorders, and associated safety concerns. They are increasingly focusing on designing more ergonomically improved hand tools that will yield improved precision and be easy to operate. To achieve this, hand tools manufacturers are coming up with tools that are lightweight and have cushion grips to make work less tiring. DIY is the method of making, modifying, or repairing things without the help of professionals. DIY kits for household maintenance and repair consist of various tools such as screwdrivers, wrenches, pliers, hammers, and knives that aid individual in-home repairing and woodwork activities. This market research report segments the global hand tools market into the following applications (general-purpose and metal cutting), end-user (industrial and household), and key regions (the Americas, APAC, and EMEA). Of the two major end-users, the industrial segment held the entire market share in 2017, accounting for nearly 58% of the market. The market share for this end-user is expected to witness an increase of nearly 2% by 2022. The Americas was the leading region for the global hand tools market in 2017, accounting for a market share of nearly 39%. By 2022, the Americas is expected to continue dominating the market. Technavio analysts forecast the global hand tools market to grow at a CAGR of close to 4% during the period 2018-2022, according to Technavio.